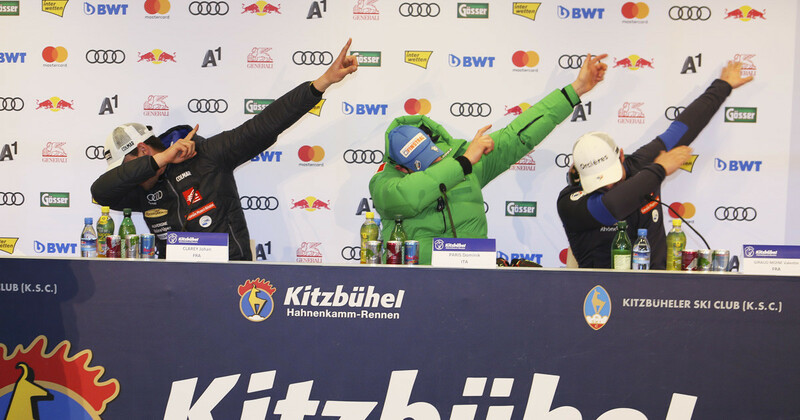 The Hahnenkamm Downhill 2017 winner’s press conference was an absolute highlight – not only because the three winners of the day provided details about the race and their emotions, but also because they demonstrated their prowess at „dabbin”, a dance form of celebration that enjoys great popularity in France. Dominik Paris (1st): To win twice at the Hahnenkamm is an incredibly special and brilliant experience. I was lucky today, as some of my competitors didn’t tackle the Hausberg section as well as I did – and that is what decided the race at the end of the day. Let’s see if we can top the party of 2013. Valentin Giraud-Moine (2nd): I risked a great deal and it paid off. I can, however, really understand what is going on here. Yohan Clarey(3rd): "I am 36, which makes it even nicer to come back again after being almost at the end of my career last year. Kitzbühel has the most beautiful podium in the entire World Cup."